Produktinformationen "Gates Powergrip® 2GT Toothed Idler 6mm Belt - 20 Tooth - 5mm ID"
For over 100 years Gates Corporation has earned itself a reputation as a pioneer of power transmission and fluid power solutions, and amongst their high-quality range of products, Gates 2GT drive belts are considered second to none. These pulleys are a highly recommended accompaniment to the Gates Powergrip® 2GT Belts. 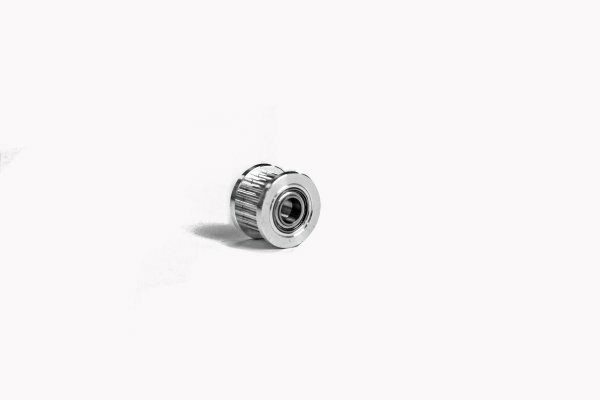 Available in a selection of sizes these come in standard 5mm bore. Toothed Idlers used appropriately in place of bearings prevent damage to the belts teeth by allowing it to glide freely and gently cups its teeth as it traverses around the curve.Smoothed Idlers are purposely designed, with correct flanges and clearance to ensure a belt retains a constant tension throughout its entire stroke in a way bearings could never match. Weiterführende Links zu "Gates Powergrip® 2GT Toothed Idler 6mm Belt - 20 Tooth - 5mm ID"
Kundenbewertungen für "Gates Powergrip® 2GT Toothed Idler 6mm Belt - 20 Tooth - 5mm ID"